If you were asked to make up a list of South Africa's top 10 tourism experiences, the African wildlife safari would most likely feature in the number 1 spot. It is one of the main reasons why most people go to South Africa on a vacation. And yet the country offers much and much more than "just" safaris. In fact, there are so many other incredible things to see and do that can't be experienced anywhere else in the world except in South Africa. You could fill an "experience of a lifetime holiday" without even thinking of a safari at all. Something you can't say of most other destinations in Africa. On this page you will find a kind of bucket list selection of the top 10 tourism experiences in South Africa that you should not want to miss and, to have it all, you can still easily combine them with a great safari experience. Table Mountain with Cape Town at its feet viewed from Blouberg beach. South Africa is truly a scenic masterpiece filled with diverse natural beauty that is unparalleled anywhere else in the world. Places to be still, places to inspire you, places to explore or to simply revel in the joyous gift of nature. North to South and East to West this scenic paradise really does have it all. 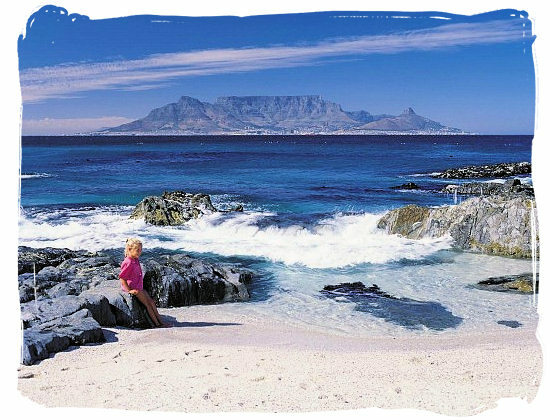 Enjoy this video about South Africa's natural beauty and breathtaking scenery and mix of cultures. Wine Estate in the Paarl north of Stellenbosch with the Drakenstein mountains in the background. 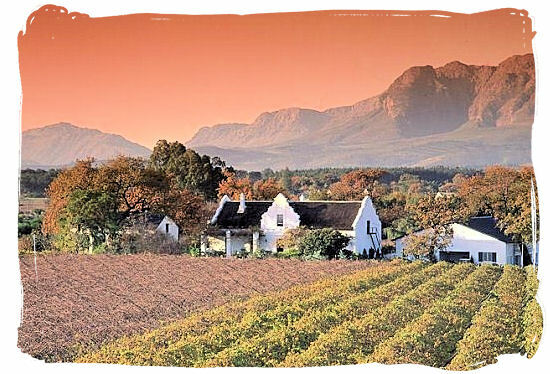 South Africa is a wine connoisseur's dream destination. With wine farms and estates stretching across the entire Cape region, there is no shortage of places to whet your appetite. From self-navigating wine routes and organized tours of the wine country, to holidays planned around wine tasting events and festivals. Our Port and Brandy routes are renowned too. Game drive in the Sabi Sabi luxury private game reserve. Watch this video and discover MalaMala, the largest private game reserve in South Africa and a blueprint to a luxury safari. See rhino from your balcony, stand a few feet away from a herd of elephants and go to sleep with a lion's roar in your ears, awesome, right? 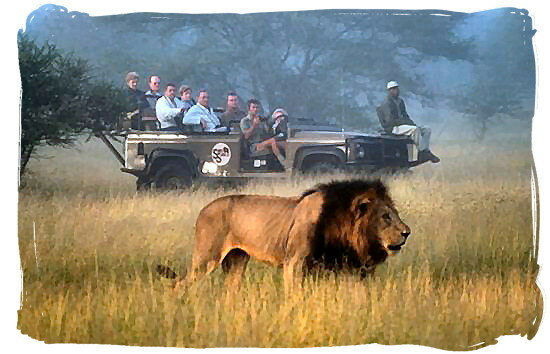 One of the most popular and sought after South African vacations is the safari. This doesn't necessarily mean roughing it in the bush far away from modern conveniences. 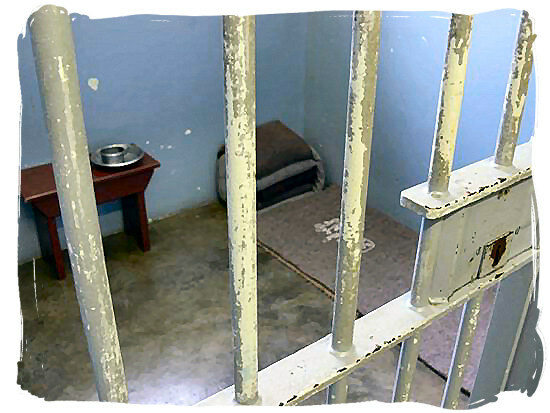 The 2,4 x 2,4 meter (8 x 8 feet) cell in Robben Island prison in which Nelson Mandela spent 18 of his 27 prison years. Video showing short biography of Nelson Mandela, depicting his life and career. South Africa's history is as colourful as the rainbow nation that resulted from it. Our past is fraught with struggles. The apartheid regime caused a rift so deep in our nation, the effects of which we are still trying to overcome today. 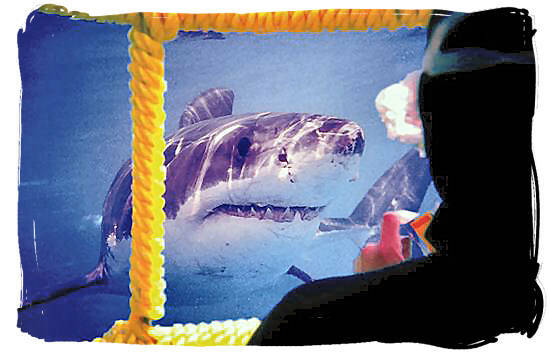 Face to face with a Great White Shark up close, safe in a floating shark cage. Video showing South Africa as one of the best destinations worldwide to go whale watching at the eastern and western cape coasts. Imagine coming face to face with the wide open jaws of a great white shark or watching pods of hundreds of dolphins glide through the waves. Imagine seeing a colossal whale break through the ocean surface spraying water through its blowhole or getting up close and personal with seals and penguins as you observe them in their natural habitats. 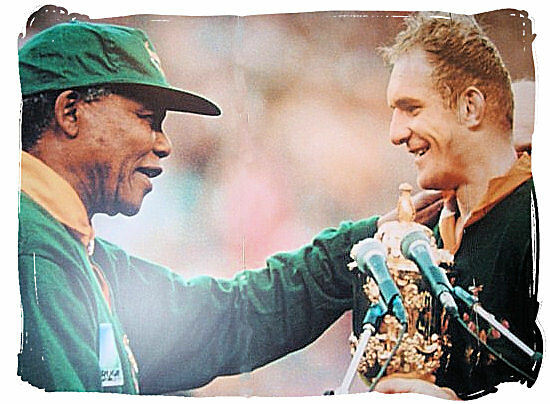 Nelson Mandela congratulating Francois Pienaar, captain of the national Springbok rugby team that won the world rugby championships in 1995. Discover our rich history, culture and heritage and learn what our people are all about. South Africa is a veritable cultural melting pot, a fusion of different, styles, ideas and traditions. It's different and exciting and at times difficult, but it works, there is no other place on earth like South Africa. Our multicultural diversity is what defines us. It's woven into the fabric of our existence. 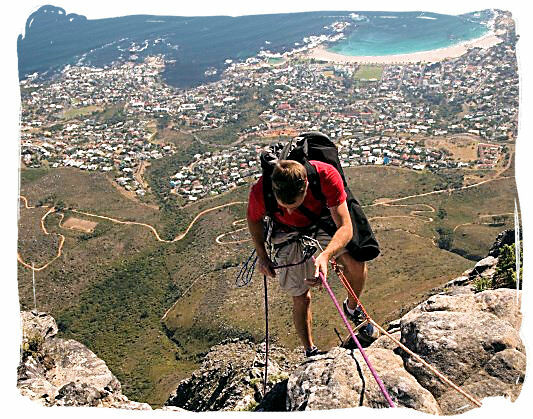 Abseiling off Table Mountain's sheer 1000 meters high cliffs is a totally safe and very exciting adventure. Watch this video and follow Rachael Scobie, National Geographic Adventure Ambassador, on her adventures in South Africa. Calling all thrill seekers! Do you live for adventure? Do you love to get your blood pumping and feel the rush of adrenaline through your veins? South Africa's outdoor activity and adventure menu is so extensive that you will be spoiled for choice. So pick your playground, land, water or air, and come push yourself to the limit with a host of exhilarating activities that will leave you begging for more! Feeling the pulsing beat of urban life in South Africa's cities. 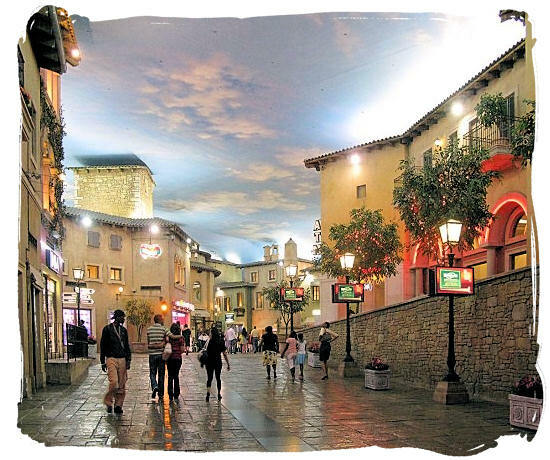 Montecasino in Sandton JHB, one of Gauteng's premier leisure and entertainment centers. Experience the pulsing beat of urban life in South Africa's cities, exciting mix of first- and third-world influences. Be lured into South Africa's urban jungle, a cacophony of bright lights, movement and noise that stimulates the senses and culminates in an unforgettable adventure. There is so much to see and do that the only problem will be finding the time to fit it all in. Enjoying the tantalizing flavours and variety of South Africa's exotic rainbow Cuisine. 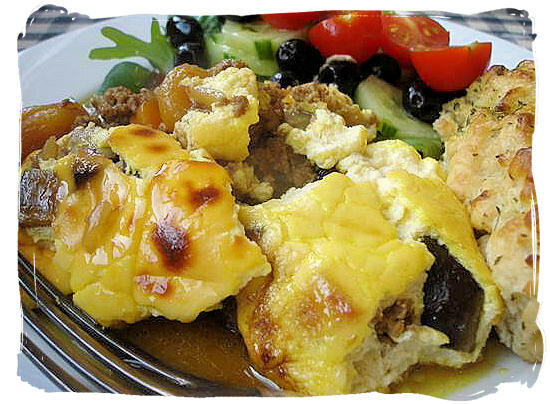 Bobotie, a traditional and delicious dish of meat with curry spices, chutney, almonds, and raisins, served with boiled rice and chutney. In this video four Australian travelers are blown away by South Africa's wine and exotic rainbow cuisine. Just as historical influences are responsible for our diverse, multicultural society, so they have resulted in our "rainbow cuisine". It's been said that history is the main ingredient in most of South Africa's food. The fusion of the immigrant Indian, Malaysian and Dutch cultures with the colonial and indigenous influences have left an indelible stamp on our food that is still evident centuries later. 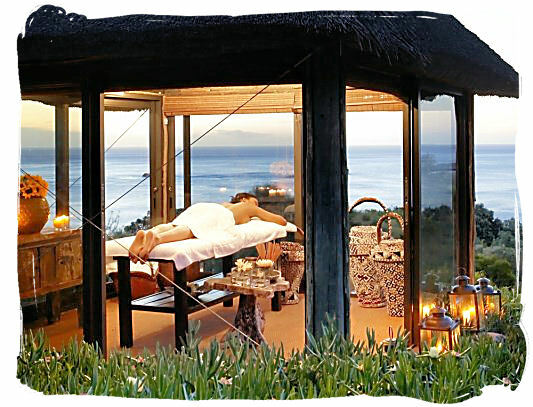 Enjoy a Moya Crystal Massage at the luxurious Twelve Apostles Hotel and Spa, Cape Town. A video about Garonga Safari Camp, an exclusive game reserve camp offering luxurious health and wellness treatment next to unforgettable wildlife encounters. Think relaxation, pampering and serenity combined with professional service and 5 star treatments in some of the most spectacular surroundings in the world, that's what you can expect when you visit one of South Africa's luxurious health spa's. Relax, de-stress and lose yourself in one of our specialized traditional treatment experiences, where expert fingers and fragrant indigenous balms and oils provide a heady mix to invigorate your soul.